Through the cochlear implant, the gift of hearing has been given to over 300 severely to profoundly hearing-impaired patients at Charlotte Eye Ear Nose & Throat Associates, P.A. (CEENTA). The cochlear implant is a device that provides electrical stimulation to the cochlea, which results in the perception of hearing. There are currently three cochlear implant companies in the United States: Cochlear Corporation, Advanced Bionics Corporation, and Med-El Corporation. The CEENTA cochlear implant team has extensive training and experience in the implantation and programming of cochlear implants. This team has seen cochlear implants develop into a viable option for the severely and profoundly hearing-impaired through technological advances in both the external and internal device. The cochlear implant differs significantly from a hearing aid in that it bypasses the damaged end organ of hearing, allowing for stimulation of the remaining nerve fibers, which results in hearing. The rewards and benefits of the cochlear implant are unsurpassed. In many cases the advances in cochlear implant technology have allowed patients who have lost their hearing to regain the ability to hear and understand speech and to use the telephone. who is a good candidate for cochlear implants? Cochlear implants are now available for young children 12 months of age and older who have not obtained adequate hearing through hearing aids for the development of speech and language. The cochlear implant consists of two parts, one internal and one external. The internal portion of the device is implanted into the cochlea during a 2- to 3-hour surgical procedure. Following a period of healing, the external portion of the device is programmed for optimal hearing during a series of appointments with an audiologist. The external portion of the device is becoming smaller and smaller and many of the devices are now available in a size that resembles a large behind-the-ear hearing aid. Cochlear implant results vary from person to person. Benefits include the development of speech and language in young, profoundly hearing-impaired children, and a return of hearing for adult patients. Technology in cochlear implants is rapidly advancing. 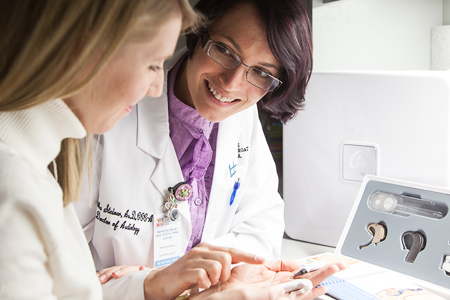 If you have questions or concerns regarding cochlear implantation please contact the CEENTA Audiology Department at (704) 295-3300.